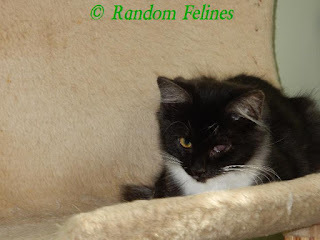 The vet at the spay/neuter clinic got a better look at Acorn's eye after mom dropped her off. The vet was concerned about the "vascular nature" of her eye and said to use a different drop for a few days and delay surgery. So after spending the day at the clinic, she came back here Friday afternoon and will be around for a little while. Mom is hoping to get everything cleared up and get her spayed before Christmas so she has a good chance of going home. The little kittens have been spending some time outside their room. Two of them have figured out how to get over the gate, so mom just moved it and they get time out to run around and are then put back for a time as well. Plus there was that football game late Saturday night that kept mom up until midnight. At least those green guys won. We're purring that Acorn's eye improves so she can find her furever home soon. The mom watched those green guys play too...and was happy they won. The sooner you get well, little Acorn, the sooner you'll be able to rule the roost in your own home! Oh no I hope Acorn will recover soon. do you know what happened? Everything is a learning adventure for kittens - even escaping. I hope Acorn's eye improves. It must be uncomfortable for her. Paws crossed for Acorn's eye so she can get that spay! Aaaaaw Weez sendin' purrayers fur all. Poor Acorn, I hope that eye gets better soon. Purring for Acorn's eye... Was looking at older posts that I pinned at Pinterest and was wondering what happened to River Diva? Purrz, Katie Kat.